I. American Legion – They had a 2nd violation of serving non-members while members were not present. Their lawyer worked out a deal with the town attorney, that if it happens a 3rd time (It happened in 2012) a 40 day suspension of their liquor license will be imposed. II. Attorney-Client Communications: Noise Ordinance Amendments (In Private Session) – Nothing Discussed in Public Session EXCEPT for dissatisfaction that this is still NOT addressed. III. Town Flooding – We keep going round and round and hearing ‘ we’re “4 th ,5th ,3rd ” in line for funding’ and in the mean time nothing, and we’re looking into other funding. You maybe remember this shovel ready project in 2010. We were in line for funding then too. What happened, nothing except Irene and Sandy. The survey will be open for 3 weeks and reported back to Council at the Nov 5th Meeting with results of the RFP. Maybe it was aliens? Drunken DPW in the middle of the night? Ghosts? Mischieviants? 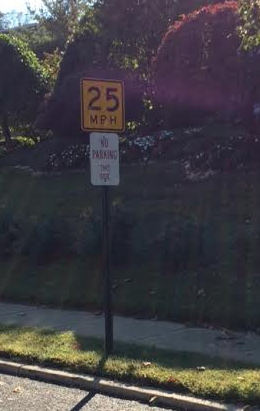 How do you think the “No Parking” signs exist on Portland road? Previous Question: What’s New & Coming to Highlands? For the American Legion, I believe they have to have no liquor license violations for 12 months. If they do,the 40 day suspension goes into effect. If my understanding is correct, this is just a slap on the wrist unless the police/ABC will be checking up frequently. This is just twice in two years that they got caught.